On January 1, 1906, a group of Christians met at the home of Mr. and Mrs. Andrew Anderson for the purpose of laying plans for the building of a church. Motion was made and carried that the name of the church should be "Swedish Christian Mission" at Lake Union, not to belong to any orgnization or conference. Mr. Hedwin Olson donated approximately one-quarter acre of land for the church lot. Decision was made to accept donations for the building fund and labor for the church. Several of the men in the community helped with the building and materials. On November 10, 1906, after much prayer and sacrificial planning on the part of our pioneer Christians in the community, a small group met at the home of Mr. and Mrs. Andrew Anderson for the purpose of organizing a congregation. Upon motion made and carried, it was resolved that "the name of this congregation shall be the Swedish Chrisian Mission congregation (Independent) of Lake Union, North Kingston, Meeker County, Minnesota." The church was incorporated at Litchfield, Minnesota, January 1907. 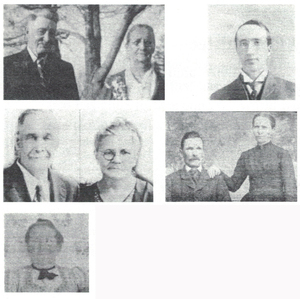 Mr. and Mrs. Andrew Anderson, Mr. Gus Werner, Mr. and Mrs. John Hasselberg, Mr. and Mrs. Hedwin Olson, and Mrs. Anna Maria Olson. John Hasselberg was elected chairman; Gust Werner, clerk; Andrew Anderson, treasurer; Hedwin Olson, deacon; Hulda Hasselberg, deaconess. Before and during the time of building the church, meetings and Sunday School were held in Lake Francis School and in the homes. The pews were made of home sawed planks. In 1908 chairs were purchased with donations. In 1910 an organ was purchased, being replaced later by pianos. The first hymn books were the Swedish "Evangeli Basun" and later "Sions Basun." Our first English hymn books were "Victory Songs," then "Mission Hymns," "The Covenant Hymnal," and "Worship and Service Hymnal." The first lights were kerosene lamps, later gas lamps. Electric lights were installed in 1937. A basement was added in 1939 and later finished with paneling. In 1946 pews were purchased with memorials given by members and friends of the church. The church constitution was translated into English and adopted January 2, 1939. Recognizing a need for fellowship with other churches, the congregation decided to join The Northwest Conference of the Evangelical Covenant Church of America at the January 1935 meeting. Our church adopted the Covenant Pastors Plan in 1944. In January 1981 the congregation was given an invitation to join The Evangelical Covenant Church of America, currently known as The Evangelical Covenant Church. We were accepted as members of the Annual Conference in Columbus, Ohio, in June 1981. In 1990 the field adjacent to the church parking lot was purchased from Norma and Kenneth Zander, assuring adequate parking space and room for possible future expansion. The unused part of the field was planted with trees, following conservation practices and enhancing the overall appearnace of the church grounds. Improvements to the church building occurred in 1974 when an enlarged entrance and bathrooms were added. In 1981 a kitchen was addd to improve the fellowship hall in the basement. In 1992 the narthex was enlarged, an office was added as well as a nursery. Memorial donations have been used to furnish new hymnals, banners and other items used in the church. Our most recent hymnal, "The Covenant Hymnal," was dedicated in the spring of 2005. In 2006 a new sound system was purchased and installed using the "Second Miler" grant.